The MVV 1296-VOX mast pre-amp is a low-noise antenna pre-amplifier in a double-shelled housing. The outer housing made of ABS is weatherproof and suited for mast mounting. The inner metal housing ensures a high shielding factor against unwanted irradiation and protects the components of the amplifier against harmful environmental influences effectively. 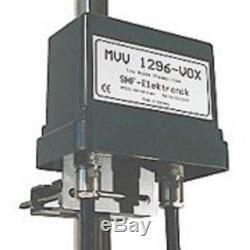 The MVV 1296-VOX has two stages to gain enough amplification for longer feed lines, also. The input stage is equipped with a low-noise microwave GaAs FET, the second stage uses a microwave IC (MMIC). The amplification is continuously adjustable, which helps to adjust to particular cable lengths. A three-circuit stripline filter provides the necessary preselection. The MVV 1296-VOX is equipped with UHF-capable print coaxial relays, which ensure a low-attenuation carriage of the transmission power. Transmit/receive changeover is done via a PTT input or automatically by the integrated HF-VOX. With the protection circuit even in VOX operation a reliable transit/receive changeover up to 180 Watt at SSB mode is guaranteed. The operating voltage is supplied either via a separate two wire line or by remote power via coaxial cable. If the transceiver does not already provide 12V voltage for powering a pre-amp via coaxial cable, then another Bias-T Order No. 26137.23 for remote power supply is required. Technical Data Receive Pre-Amplifier MVV 1296 VOX. Power (SSB) 180 Watt Max. Insertion loss < 0,5 dB. Supply voltage 13,5 V. The item "MVV 1296 VOX Mast pre amplifier for 23 cm" is in sale since Friday, March 16, 2018. This item is in the category "Mobile Phones & Communication\Radio Communication Equipment\Ham/Amateur Radio\Ham Radio Amplifiers". The seller is "nocando01" and is located in Redruth Cornwall. This item can be shipped to United Kingdom, Austria, Belgium, Bulgaria, Croatia, Cyprus, Czech republic, Denmark, Estonia, Finland, France, Germany, Greece, Hungary, Ireland, Italy, Latvia, Lithuania, Luxembourg, Malta, Netherlands, Poland, Portugal, Romania, Slovakia, Slovenia, Spain, Sweden, Australia, United States, Russian federation, Canada, Brazil, Japan, New Zealand, China, Israel, Hong Kong, Norway, Malaysia, Mexico, Singapore, South Korea, Switzerland, Thailand, Saudi arabia, South africa, United arab emirates, Ukraine, Chile.